Your experience flying on Emirates starts with the joy of check in. 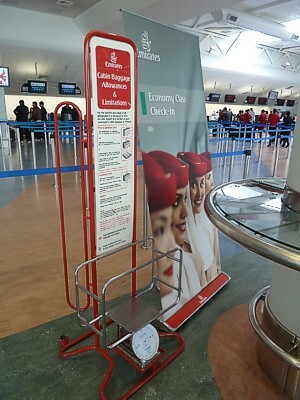 At all airports there are dedicated business and economy check in desks. Only Skywards Silver and Gold can use the business check in if travelling on an economy ticket, but it saves a lot of time. There are generally leagthy queues, with many passengers making use of Emirates generous 30kg baggage allowance in economy. 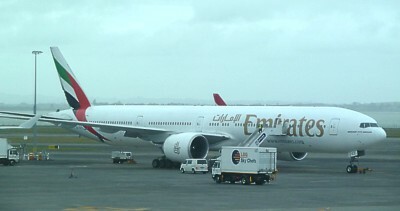 Emirates have a very strict boarding regime: they also make use of the twin or tripple air bridges at most airports, with economy and business class passengers separated. Business and First, plus Gold Skywards members can board at any time; other than that children board first, then transit passengers, then all others in a kind of almighty scrum. There are Newspapers on a trolley on the airbridge, however there are only 3 or 4 of each type, other than the Dubai Daily, so to get a newspaper you have heard of you have to be quick and early in the scrum. As soon as you board the IFE is already switched on, so you can watch films or TV while you are waiting for everyone else to get on board. In Business Class you are sometimes shown to your seat as you present your boarding card, although this is fairly rare, and you're left to find your own way. At some airports there is a carnation on the between-seats shelf. (Note that many countries will not let you take this flower off the plane). At your seat the mini bar is already filled, and the headphones, socks and eyeshades are already at your seat. Business gets a menu about twice the size of the economy menu which are at the seats before takeoff, and this disguises the fact that on some flights economy gets the same meals as business. Alas, there is no wine list: you have to know to request one while you are still on the ground. 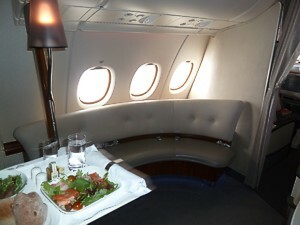 There are then hot towels, and a run of Sparkling Wine, orange juice or water for pre-flight drinks. These come around on a tray, but there are always only three Sparkling Wine on the tray: as a result, the crew continually nip back to the galley to get their regulation three glasses, advance three more passengers, and then return again to the galley. There are then lots of inflight announcements, and a long video on using your video screen. Before takeoff orders from the menu, but the crew firstly come to Gold card holders, and ask them for their choice, and then four crew members start in each aisle at the front and the middle of the cabin, and work their way backwards asking for meal choices. If you are at the back of the cabin (or the middle such as row 14 on the A380) - or out of your seat - you can find there is little choice left when they come to you: as a result it's crucial to stay in your seat when the meal orders are being taken. Woe betide you if you change seat - the meal requests can skip you entirely, and then when the meals are delivered an hour into the flight, you can find nothing has been heated for you, and you have to place an order then. Once you are aloft, about 30 minutes in, the crew come around with table cloths, empty wine glasses, but full glasses of spirit orders. It can be another 30 minutes before the wine glasses are filled: hence, if you want a drink quickly, you should ask for a short order, and a wine glass when orders are being taken before pushback (or, just go to the bar). When the wine glasses do appear, they come around in a neat four bottle holder, with an extra wine glass perched in the middle (for those who didn't get to place an order. Meals come around (on short flights on a tray with both the starter and the main), and then the dessert about half an hour later. 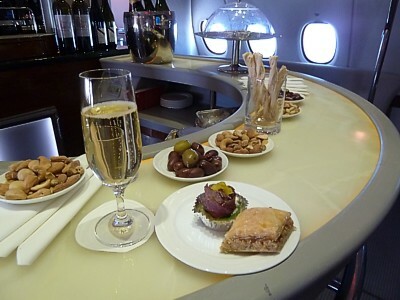 During this time, the bar at the back of the aircraft is open: you can nip back here at any time, however the bar will start to close about an hour before landing: last orders are at 30 minutes before touch down, but you can get a refill just a minute or two before this point, and take it back to your seat. In Economy hot towels are handed out before takeoff (on a lovely silver tray) and then the menus are handed out. Other than that there are no perks. Drinks service is very slow - it comes along about 30 minutes after the meals are served. The loos are however quite good - even economy has some soaps and perfumes (locked away in a perspex container) and the same light airy colours as the main cabin. Should you be unlucky enough not to get on a plane with AVOD, films start about 20 minutes after takeoff. There is a sheet of "Do Not Disturb / Wake for Meals" stickers in the headphones bag, but they are generally ignored by the crew, who will leave you to sleep during meals. Indeed, one crucial lesson in all cabins, is that it is vital espessially if you are flying in the premium classes, is never, ever, to fall asleep before the meal service starts. Emirates crew are trained to never wake up a sleeping passenger for meals, that mean if you are asleep, the meal service will pass you by, and you'll get no food. This can be exceptionally annoying, particularly if you are flying First on a short 4 or 5 hour flight: even if you wake up an hour before landing, the crew will tell you that you are too late for food, and at best will bring you out a small tray of nuts. Because many of the crew are young, and forgetful, even if you tell them that you are going to take a short nap, they may still forget to wake you. The moral is clear - never try to sleep on an Emirates flight if you want food. Emirates has a very generous free baggage allowance for each flight, on most flights, however Emirates vary what you can check in by route. This is in itself curious, and even more oddly, instead of using it as a marketing tool and shouting about it, the luggage allowance is hidden away behind a calculator on the Emirates website which makes it hard to work out what you're allowed to check in for free. 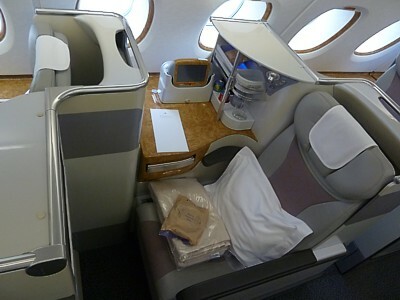 Emirates Cabin Bags: The simple rule is that Economy takes one, Business & First take on board two bags on Emirates. Economy Class passengers can take hand luggage of one bag weighing up to 15 lb (7 kg), They must be no larger than 22 x 15 x 8 inches (55 x 38 x 20 cm),and even these are a squeeze getting into the side lockers on the Boeing 777. Business & First class can this, plus a handbag, garment bag, or laptop case. Rules on contents (such as liquids) apply. 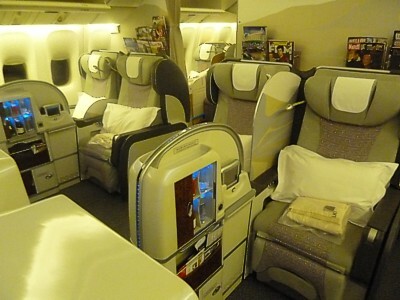 In economy, there is often a check at the gate at Dubai to see if you are over the limit in economy, but it is rare for there to be a check in Business Class. Emirates Check in luggage: On all routes except to the United States economy class can check in one bag weighing 30kg, business class can check in two bags up to a total weight of 40kg, and First class can check bags up to 50kg. Routes to or via the United States have economy with two bag allowed to 23kg, business class with two bags (each 32kg max) and that is also, oddly, the limit for First Class. 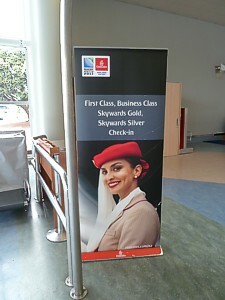 Emirates Skywards Silver Frequent Flyers gain an extra 12kg checked in luggage allowance, while Emirates Skywards Gold gains an extra 16kg of checked in luggage allowance (or one extra bag if via the US). Beware that you are likely to be mugged at the airport with Emirates excess bag charges. 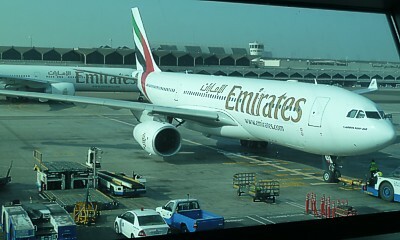 For example, an extra 10Kgs at Heathrow, just on the hop to Dubai, will cost a thumping 250 quid! The airline rakes in a lot of cash from these extra fees, so not surprising there are a lot of traumatic scenes at check in. Regular passengers have been known to get their luggage absolutely on the limit, and then stuff their pockets with heavy items, while wearing 2 coats, jackets, and so on. Once they are onboard, and past the hand luggage guards at the gate, you'll then see them take everything out of their pockets and load up their hand luggage. Other crafty passengers buy additional checked baggage allowance on Emirates online, although this only gives you a 20% discount when managing an existing booking, and it may be cheaper to take a gamble and pay the exorbitant 25GBP per kilo at the airport. This rises to an amazing 35GBP if you are in business class. Beware, too, that some scales, particularly at Dubai airport, are not that accurate, and one scale may say you are 6kg over, and you'll be hit with a £200 charge, and another scale may have another reading. You are not entitled to a second opinion at check in, so it is often worthwhile being some way under the limit. As always these rules can change at short notice. Emirates's website has details of exactly what you can take onto a flight.